Westminster Abbey’s Medieval Stained Glass: New Discoveries, Innovative Conservation and Splendid Display. The opening of the Queen’s Diamond Jubilee Galleries at Westminster Abbey this Summer drew much attention in national media. The new galleries, located at the eastern end of the Abbey, some 52 feet above the Abbey floor, display a variety of previously unseen objects from the Abbey’s collections. Among these are displays from the surprise discovery of a cache of almost 30,000 pieces of stained glass from the medieval abbey, some installed in the galleries themselves, others incorporated into two new windows. Here, Laura Atkinson of Canterbury Cathedral Studios, and Prof. Richard Marks discuss the discovery, the art historical significance and the conservation of this exciting collection. Fig. 1. Clearing the triforium vaults at Westminster Abbey © Dean and Chapter of Westminster. In November 2015, Westminster Abbey approached The Cathedral Studios at Canterbury with a collection of stained glass fragments. They had been discovered during work to prepare the triforium for the new Galleries, among a range of discarded materials that had found their way into the cells of the vaults before a wooden floor was installed in the triforium by Sir Christopher Wren in the early eighteenth century (Fig. 1). The discovery was cause indeed for celebration. Westminster Abbey was central to the religious and political life of Medieval England. Initially founded as a Benedictine monastery in the mid-10th century, in 1066 it became the nation’s coronation church; with the translation of King Edward the Confessor’s remains to the church shortly after his 1146 canonisation, the Abbey added pilgrimage church to its list of credentials. In 1245, Henry III began his dramatic reworking of the church in an English response to the new Gothic style of northern French cathedral building; English monarchs continued to make their mark on the Abbey until the construction of Henry VII’s spectacular Lady chapel, consecrated in 1516. A cluster of medieval monarchs and their consorts also followed Henry III in choosing the Abbey as their final resting place, transforming it into a royal mausoleum. It is particularly lamentable, therefore, that, prior to the recent discoveries, the known remains from the vast body of medieval stained glass that would have once filled the windows of the Abbey were limited to the small fragment collections surrounding the early sixteenth-century figures now in the apse clerestory and in one of the cloister windows. Glass showing a wide variety of subjects survives from this period, including portions of figures, winged beasts, heraldry, painted grisaille, inscriptions and borderwork. Among the more significant are a tonsured head (Fig. 2); portions of three probably monastic figures in robes of blue glass (as was typically used to represent black garments in medieval glass); and a white garment, probably part of a clerical tippet. These can be related directly to a series of (restored) panels from the Abbey on display in the Jubilee Galleries (Fig. 3), depicting scenes from the Life or Passion of Christ, episodes from the lives of St Nicholas, St Stephen and perhaps St Alban, St John the Baptist or St Paul. If, as seems likely, these panels reflected in their subject matter the dedication of the spaces in which they were originally housed, the tonsured head and monastic robes can perhaps be associated with St Benedict, to whom the Benedictine community at medieval Westminster is known to have dedicated a chapel at the junction of the choir and south transept. Fig. 2. A surviving image of a tonsured head, dating to the second half of the thirteenth century © Dean and Chapter of Westminster. Fig. 3. Thirteenth-century panels on display in the Jubilee Galleries. Fig. 4. One of a pair of thirteenth-century winged beasts discovered at Westminster © Dean and Chapter of Westminster. A feature of the Abbey glazing of this period unknown prior to the recent discoveries is the presence of two monochrome winged beasts (Fig. 4), the contexts of which remain to be discovered. Although identical in design, the two are undoubtedly the work of different glaziers, working from the same cartoon. Fig. 5. Record photograph of some of the painted white-glass grisaille fragments from the Westminster cache © Dean and Chapter of Westminster. Alongside these figural fragments survive numerous pieces of white glass painted with various foliate designs, as well as a number of quarries with foliate motifs (Fig. 5). These fragments underscore the importance and likely prevalence of this so-called grisaille work in the great churches of this period. Particularly when they are taken together with nineteenth-century descriptions of the glazing at the Abbey, which detail panels of this grisaille at locations across the church, as well as glazing accounts from the medieval period detailing the purchase of substantial quantities of white glass. As Prof. Marks emphasises, the extent of non-figurative glazing in thirteenth-century great churches has traditionally been under-estimated, not least because of the tendency of nineteenth-century restorers and antiquaries to preserve and focus upon coloured figurative glass. Although quantities of thirteenth-century grisaille glass survive from this period at York Minster and Lincoln and Salisbury Cathedrals, it is only in York’s north transept façade window that it substantially remains in situ. Although a small handful of pieces have parallels with glazing of c.1330-50, perhaps tying in with records of glazing activity at Westminster in 1338, 1341-3 and 1362, the majority of fragments from this period are clearly post-1400 in date. Of outstanding quality among them is a partial bearded head (Fig. 6), probably representing a prophet, so close in style and execution to the heads of a series of English kings in the great west window of Canterbury Cathedral (Fig. 7), glazed between 1396 and 1411, that it must have been executed by the same glazier, and, therefore, be of about the same period. This is tremendously significant, as although we know from documentary evidence that London was a major centre for glaziers from at the least the thirteenth century, there has been a dearth of any surviving glass prior to the early fifteenth century which can firmly be linked to London craftsmen. With the discovery of this exquisite prophet’s head, Westminster joins Canterbury, New College, Oxford, Winchester Cathedral and School chapel, as well as York Minster, as commissioners of works by the leading proponents in stained glass of the International Gothic style. Fig. 6. Partial bearded head, probably of a prophet, datable to c.1400, found at Westminster © Dean and Chapter of Westminster. Fig. 7. Bearded head of a king from the great west window of Canterbury Cathedral, 1396-1411. Fig. 8. Re-united fragment group showing peacock feathers and sunburst banner, from the Westminster cache © Dean and Chapter of Westminster. Fig. 9. Detail of the Nine Orders of Angels window at All Saints, North Street, York, showing sunburst banner. Several pieces survive from the first decades of the fifteenth century providing glimpses of the range of iconographic choices made for the stained glass produced for the Abbey at this period. These include a collection of (reunited) fragments painted with peacock feathers and the device of a sunburst on a banner (Fig. 8). The feathers resemble eyes, which frequently occur on depictions of angels in the Middle Ages, referencing Ezekiel 10:12, ‘And their whole body, and their backes, and their handes, and their wings, and the wheeles, were ful of eyes round about, euen the wheeles that they foure had’ (King James Bible, 1611). The sun banner occurs held by Powers in the window depicting the Nine Orders of Angels in All Saints, North Street, York (Fig. 9), probably suggesting that a window depicting the Nine Orders was also to be found at the Abbey. Elsewhere, the remains of various small-scale figures, images and canopy work suggest the Abbey was patron of the narrative style of window (probably, from the remains, including episodes from the lives of Christ and other saints) apparently made fashionable by John Thornton of Coventry’s spectacular great east window at York Minster. When Westminster Abbey approached The Cathedral Studios initially, the brief was to sort and record the finds, but subsequently the Abbey decided to utilise a selection of the fragments, some for display in the new Galleries and others incorporated into two new windows. In addition to identifying glass of particular artistic and/or historical interest, it was hoped that any fragments that identifiably belonged together might be reunited. Questions about what kinds of fragments might be included in the new windows also needed to be answered. It was vital that the studio developed the correct methodology for the handling, sorting and recording of the finds. Any archaeological information also needed to be retained. The many bags and boxes of fragments were worked through methodically; each piece was categorised, photographed, and a database detailing the dates and locations of the finds was produced to accompany the hundreds of images. Fig. 10. Sorting the fragments © Dean and Chapter of Westminster. Fig. 11. Test piece with silver stain © Dean and Chapter of Westminster. Fig. 12. Single-light window of richly-coloured glass fragments in the bridge to the Jubilee Galleries © Dean and Chapter of Westminster. After many weeks’ work, a staggering total of 29,860 finds had been sorted (Fig. 10). Some fragments, although not physically connecting with others, were identifiable through their painted decoration as originating from the same window or glazing campaign. But others were found, as hoped, during the sorting process, that did belong to each other. Two of these groups were the thirteenth-century winged beast (Fig. 4) and the peacock feather and sunburst design dating to the fifteenth century (Fig. 8). Frustratingly, with the latter, despite subsequent thorough searching of the image database, one small fragment is missing on what would otherwise be a complete piece! 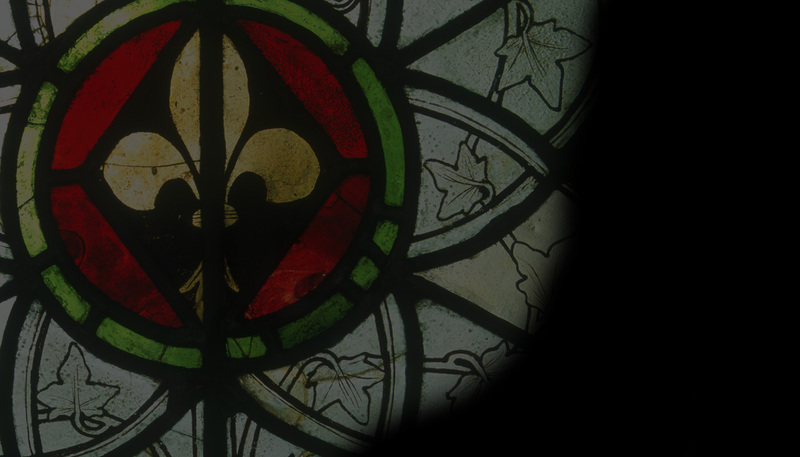 Finds relating to the manufacture and makers of the stained glass were also discovered. A number of fragments have glaziers’ marks scratched onto their surfaces, ranging, in design, from initials to what appear to be working drawings and measurements. A number of pieces of unpainted off-cuts of coloured sheet glass were found. Some appear to be crown glass with the characteristic folded-over edge to the rim. Others, more likely cylinder formed, are brightly coloured and larger. Another significant discovery was a small piece of tinted crown glass with silver stain (Fig. 11). Although not immediately obvious, this piece of glass is a test piece, made by the painter or glazier to check that the glass and stain would produce the desired colour, and it would not have been included in the finished window. These test pieces, still regularly produced today, are typically discarded and are unlikely to make their way from the site of manufacture. Among the finds were many pieces of glazing lead; some of it tangled, but other pieces shaped into deliberate large rosette arrangements or bundles. Pieces of lead that had melted, then cooled and set, were also discovered. Evidence of of the effects of extreme heat can also be seen on some of the glass. Many pieces had been fired-damaged, some of them misshapen or curled, others devitrified, with a wrinkled appearance to the glass’s surface and/or the painted decoration. Fig. 13. Bay window housing grisaille remains in the bridge to the Jubilee Galleries © Dean and Chapter of Westminster. The sheer volume of well-preserved fragments that represent the lost medieval glazing of Westminster Abbey became increasingly apparent during the sorting process. As a result, The Cathedral Studios were commissioned to work with Ptolemy Dean Architects and the Abbey to create two new windows in the bridge connecting the newly-built tower that provides visitor access to the Galleries. The first, a single light, utilises the plethora of richly-coloured surviving glass fragments (Fig. 12): the colours shifting from white at the bottom, to red, then blue, and returning to predominantly red at the top. A row of diamonds running the length of the window display a selection of ‘Star Find’ fragments. The second window is of a large, bay-shaped design (Fig. 13). It has a lighter, monochromatic palette of predominantly painted grisaille fragments, together with a selection of some of the more noteworthy finds, including the tonsured head and sunburst designs already noted. It was agreed that the size and shape of the fragments could not be altered in any way, and that all archaeological information should be retained. A number of trials were carried out to ascertain the best method of display for such a significant collection of stained glass. The brightly-coloured single-light window is predominantly leaded in the traditional manner of a fragment window. Fragments that had been earmarked for possible inclusion into the window were selected in a variety of sizes and shapes. They were arranged and placed together ensuring a good fit, leaving just enough space for the lead to be fitted between them. Care was taken to follow the working design, but inevitably the available fragments themselves dedicated the exact design of the window. With over 900 fragments included in the window, the leading was a particular challenge; great care was taken to ensure that the flow of the lead work, as well as the glass, created a beautiful result. To accentuate the jewel-like quality of the glass, the lead was left in its natural, bright state and allowed to dull down naturally over time. Fig. 14. Making the CASUS™ units © Dean and Chapter of Westminster. The treatment of the grisaille fragments, in what would become the second window, presented a particular challenge. The fragments evidently originated in windows of a number of different designs, and leading them together in the traditional manner ran the risk of creating a rather arbitrary effect. In addition, some pieces had darkened over time, or were quite small. Leading such pieces together would created a visually heavy window with little transparency or possibility of viewing Abbey through the finished window. So the question was asked: Why not dispense with the lead and display the glass as a collection of fragments? But how? In response to this challenge, The Cathedral Studios developed a new display system called CASUS™ (Canterbury Suspension), inspired by the record photography taken during the sorting stage (Fig. 5). In this, a small amount of space had been left between each fragment when it was laid flat on the light box. It was exactly this feeling of lightness and space that The Cathedral Studios wanted to achieve in the new window. Using water jet cutting, a transparent supporting frame mimicking the negative space seen in the record photography was made from float glass. Holes were cut precisely to follow the profile of the fragments; the fragments were then placed into each hole (Fig. 14), secured, and plated front and back with plating glass, and finally sealed in order to avoid the possibility of the ingress of water or dust. By eliminating the technical need for each fragment to be wrapped in lead, the CASUS™ system allows each fragment to be viewed in full. This new system was used to display all of the fragments in the bay-shaped grisaille window, as well as the ‘Star Finds’ selected for inclusion in the more colourful single-light window. The windows, now installed at the entrance of the Jubilee Galleries, give visitors a tantalising glimpse into the lost medieval glazing of medieval Westminster Abbey. The fragments appear to float, suspended, very much in the same way they had long been suspended high up in the vaults of the Abbey’s triforium waiting to be discovered.